The detailed information can be referred in the following linked sites. Optimized for use together with Can Get Signal® Immunoreaction Enhancer Solution (Code No.NKB-101) for western blot analysis. 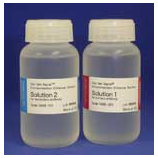 Suitable for detection of phosphorylated proteins because it does not contain any protein components. Unlike conventional blocking reagents (e.g., non-fat milk and gelatin), minimize the masking effects of low signal intensities. 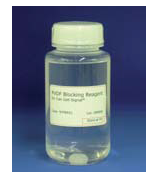 *This reagent is manufactured by NOF CORPORATION. Improves sensitivity, specificity, and S/N of IHC. Can be applied to various detection systems (e.g., chromogenic, chemiluminescence, or fluorescence). Can be used with ABC or polymer complex methods. Solutions A and B exhibit various properties for improving results. 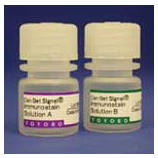 Can Get Signal® immunostain is a reaction solution that contains an accelerator for antigen-antibody reactions, which improves sensitivity, specificity, and S/N of immunohistochemistry (IHC) and immunocytochemistry.